Estes Park, CO – Active at Altitude, organizers of the 2018 US Trail Running Conference has announced a sponsorship agreement with Headsweats. This is the fourth consecutive year that Headsweats is the Official Headwear Supplier for the industry leading Conference. As part of the sponsorship agreement, Headsweats will supply custom trucker hats for this year’s event. The sixth annual US Trail Running Conference takes place in San Luis Obispo, California, on August 29-31, 2018, and is presented by the City of San Luis Obispo, CA, and Race Roster, the fastest growing endurance registration website in North America. 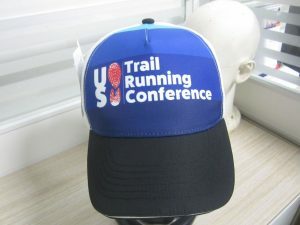 The Conference is also held in partnership with the American Trail Running Association, and Race SLO. As well as providing custom trucker hats for the 2018 event, Headsweats will also be an exhibitor at the expo for both trail race directors and trail runners, sharing information on the efficacy of partnering with the headwear brand that has become the dominant force in trail running, road running, triathlon, rowing and adventure racing. Founded in 1998 by shoe industry veteran and obsessed cyclist Alan Romick, Headsweats has become the established front runner, with more podium finishers than any other headwear company. Unsurpassed customer service, along with success and a spirit of innovation, has resulted in more than a million Headsweats hats being supplied to happy clients around the World. This entry was posted in active at altitude, headsweats, race roster, race slo, san luis obispo, slo ultra, trail race directors, trail running, trail running conference and tagged atra, colorado, estes park, headsweats, race slo, san luis obispo, shareslo, start outside, trail conference, trail running. Bookmark the permalink.